First day of the month is Theme Day for the City Daily Photoblog community. This month it is "Mystery Object." I chose a close up of something that is readily identifiable to anyone who has been to Boston and been to the Public Garden. If you haven't guessed yet, it is a swan boat. You can see how others around the world interpret this theme by clicking here to view thumbnails of all participants. This is a very beautiful shot. I love the perspective. You are looking down over seats on some sort of boat with twin hulls. And if they are in public gardens they are a slow boat to beauty. I guessed it was some sort of boat, but would never have guessed what type if you hadn't said, Excellent shot, great angle! I guessed a boat but am not sure what a swan boat is. Suggested some sort of amusement ride on a sunny day to me. 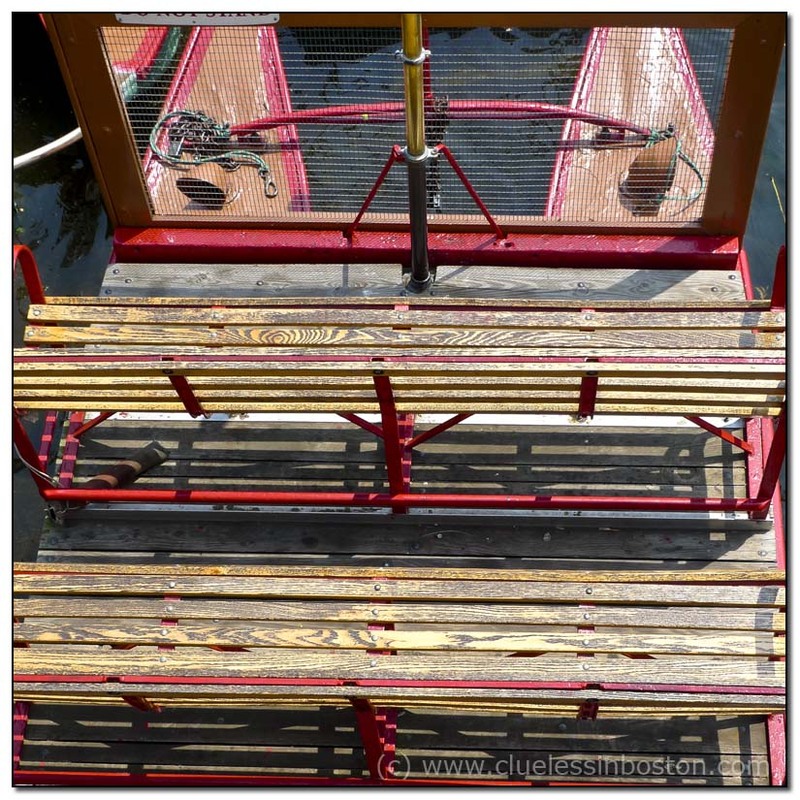 I could guess it was benches on boat, but to discover that it was a swan boat, a travel to your city was the condition! Is it a boat? Lovely photo! Perfect choice! I like this unique view of Boston Public Garden's favorite attraction. Swan boat? You'd better show us the whole thing sometime, please! I only knew it was a Swan Boat because, as the mother of a young child in the Boston area, I am very familiar with these boats! Nice lines and interpretation of the theme. Aw, you shouldn't have told them, Clueless. I had it! What do I win? Love the colors and the perspective in this shot! Wonderful! Come to Boston and you'll know the swan boat.